I have so much blooming in the garden this week that I would like to share with you. 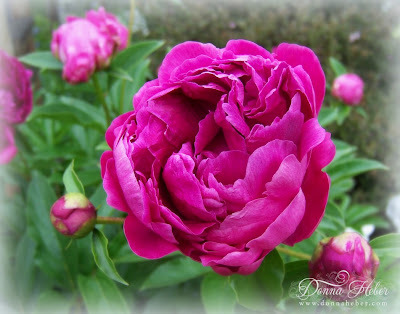 Meet 'Mary' rose by David Austin. Named for Henry VIII's Flagship she is one of the first to flower. 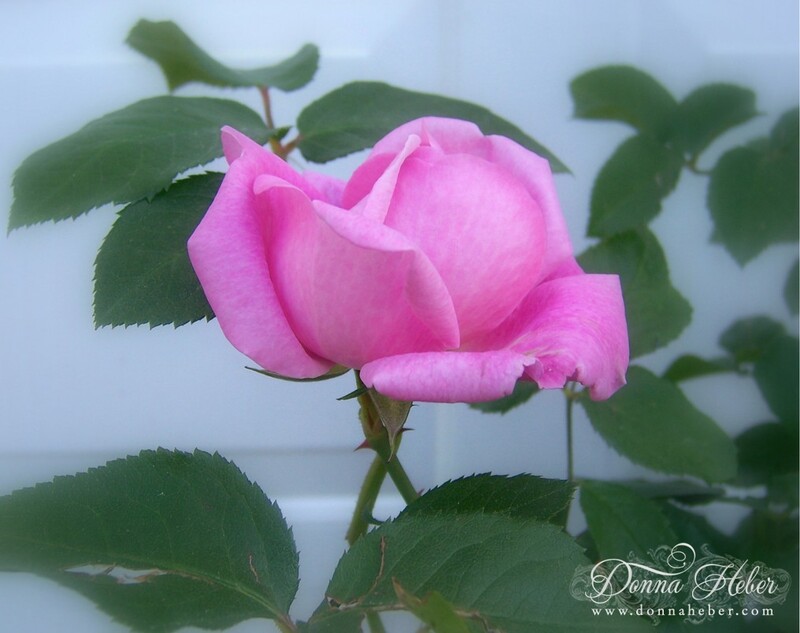 What a pretty pink complexion with a heavenly fragrance. 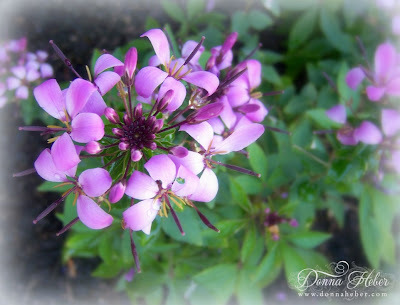 Cleome is blooming ... adding a touch to the English cottage garden. This Centaurea Montana 'Amethyst in Snow' has striking silky white flowers with royal purple centers. Unfortunately, this plant has not grown too much as I have transplanted it several times. Old fashioned peonies are still plentiful in the garden. 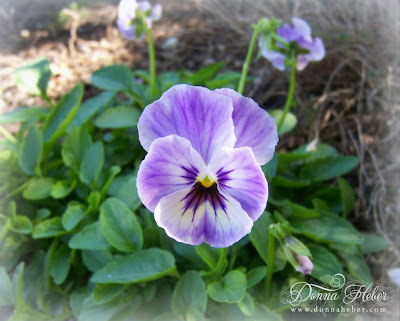 I can't seem to control my love for violas. This year I added these delicate looking flowers called 'Painted Porcelain'. Creamy white flowers infused with lavender purple and deep purple markings. They are very fragrant and will bloom all spring and summer here in the Northeast. 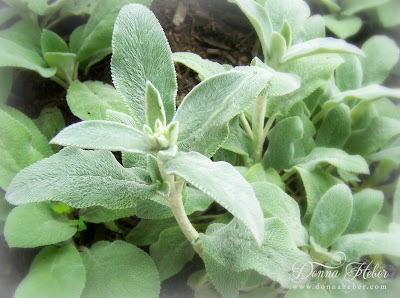 Lamb's Ear is placed where I can feel the soft and fuzzy leaves. 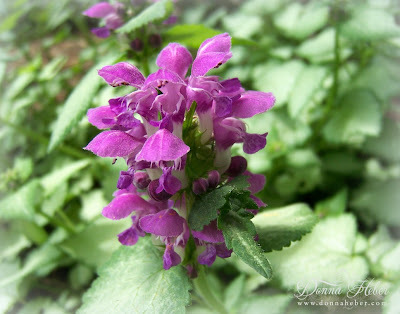 Lamium maculatum 'Purple Dragon' has stunning silver leaves with purple flowers that resemble snapdragons. 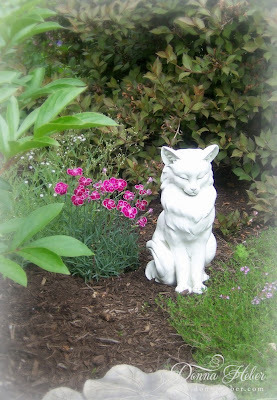 A new Persian kitty has arrived to keep critters out of the garden. The flowers to the left are Dianthus. 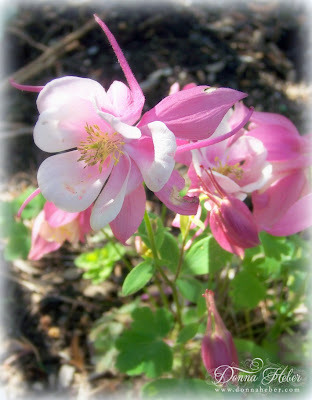 Columbine still mesmerizes me with their pure grace. 'Elsa Spath' clematis is shining this year. Her petals are at least 8" and so gorgeous in purple! 'Dr. Ruppel' is impressive with pale orchid purple, ruffled petals. 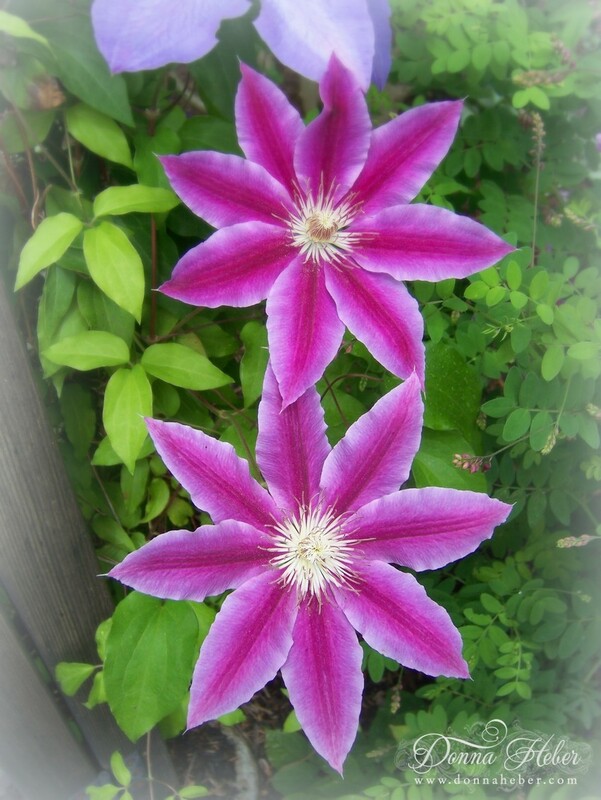 The Clematis is my favorite! They are all beautiful! I love your garden!! wow donna they all look fabulous. those peonies i love mine peonies must still get flowers it's late this year. Just beautiful. I just came n from taking photos of rosebuds. Your pictures and flowers are exquisite! Donna you do have so much in your garden that is lovely...... what a pleasure to see all flowering ..
You flowers are lovely. Such a beautiful variety. What a beautiful garden you have! And I love your kitchen, featured over there on the side bar. You have so many things I like. Donna, these are absolutely beautiful images! I especially love the first two. Such wonderful color and softness. Beautiful flowers. You have inspired be to get out and take some pictures of what is blooming in our garden. We finally see the sun here so the flowers start showing up. Have a great week. Absolutely stunning gardens Donna. I'm soooooo jealous! The squirrels keep destroying ours, but I do have a lovely rose that our son gave me for Mother's Day this year, that is currently blooming quite nicely. You have such a fantastic variety. I have never heard of lambs ear and wow, no wonder they call the plant that. Thank you so much for sharing your photos. I just can't get over how many varieties you have in your garden(s). Your photos are awesome, thanks for sharing with us! Why try to control your love for violas? Just go with it! Hi Donna, Your clematis and centaurea are just beautiful. There is lots of beauty in your garden today. Thanks for sharing your flowers! The photographs are stunning... I would never be able to pick a favorite. Gorgeous purple and pink blossoms! Thanks for coming by my blog. 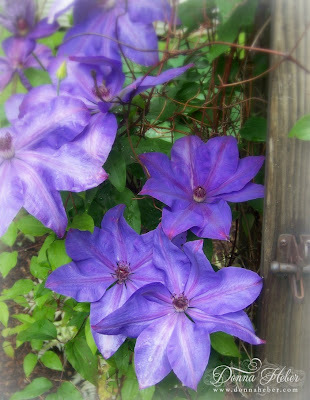 I love the images that you have with the clematises and other lovely blooms. 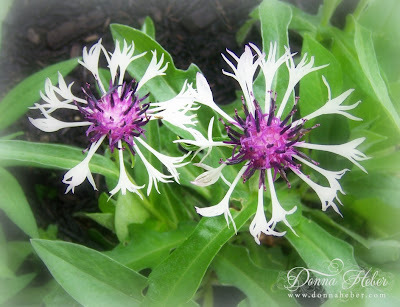 I particularly like the centaurea. I don't think I have ever seen one that color before. Simply gorgeous Donna! So much beauty in one garden. I would love to have my morning coffee in your garden! There is a special place in my gardening heart for clematis, and yours are just beautiful! I also really like Persian Kitty. Hi Donna, Thank you for stopping by my blog. These flowers are gorgeous! What a joy to see all of this beauty. Sorry for not writing sooner I have been very busy with projects and getting our great room in order. These pictures are just stunning I love them all they make me want a cup of tea and sit and chat. Your garden flowers are beautiful! Hello stopped by from Katherines Corner Blog Hop. Please visit when you can, your always Welcome. Such beautiful flower photos and I really like your blogdesign also! Beautiful flowers! My fave is the Viola. I must say, your blog design is one of the prettiest I've seen! simply beautiful garden and pictures! I really love your selection. I thought your Persian kitty was a fox! Such a pretty assortment of blooms! Your flowers are just beautiful - the pinks and purples have such vivid color! Lovely and delicate colors you have! Great shots. what a beautiful assortment of flowers ! I love your delicate and romantic style ! Thanks for dropping by my blog and for your sweet comment. Oh my goodness, Donna! I want to come and stroll through your garden and bring my landscaper, saying - 'I'd like one of these, one of these, two of these, and how many colors does this come in? Oh please, one of each!' Holy cows and cats! These are simply gorgeous! Thank you so much for sharing with us this beauty - I don't have a favorite, unless I may choose them all!! Everything looks so perfect and seems to be doing well. Just beautiful!! We had hail here Saturday and it did quite a number on our gardens. Donna I so enjoyed my stroll thru your garden. Such gorgeous blooms! Every year I think that I want to plant Cleome seeds and every year I forget. Do yours reseed and come back each year? Thanks so much for sharing with Share Your Cup. Lovely collection of floral shots!